The raw EPIC-MOS1 image of AG Peg in the (0.2 - 10 keV) energy band with the spectral extraction regions. The source spectrum was extracted from the central circle, while the background spectrum was extracted from adjacent annulus. The circled plus sign gives the optical position of AG Peg (SIMBAD). Credit: Zhekov and Tomov, 2018. Using ESA's XMM-Newton space telescope, two researchers have observed the symbiotic star AG Pegasi after the end of its outburst in 2015. The observations, detailed in a paper published September 24 on the arXiv pre-print server, could reveal the real nature of this peculiar object. AG Pegasi, or AG Peg for short (other designation HD 207757) is a binary consisting of a red giant and white dwarf. It is classified as a symbiotic nova due to its slow, nova-like outburst. The first recorded outburst of AG Peg occurred in the mid-19th century, while the latest was in 2015, during which the hot component if the binary increased in temperature. AG Peg has been observed in X-rays by astronomers numerous times. However, a discrepancy in the results of these studies regarding the properties of X-ray emission from AG Peg showed that follow-up observations of this nova were necessary in order to determine its exact nature. Therefore, Svetozar Zhekov of the Institute of Astronomy and National Astronomical Observatory in Sofia, Bulgaria, and Toma Tomov of the Nicolaus Copernicus University in Toruń, Poland, conducted new X-ray observations of AG Peg. They used the X-ray Multi-Mirror Mission (XMM-Newton) in November 2017 to study the nova after its latest outburst. "In this paper, we report results from the XMM-Newton observation of AG Peg, carried out after the end of its active phase in 2015," the researchers wrote in the paper. According to astronomers, XMM-Newton observations provided data of much better quality than that of the previous X-ray observations performed by NASA Swift and DLR/NASA ROSAT space telescopes. They noted that the new data allowed them to better constrain the properties of AG Peg's X-ray emission. The observations found that X-ray emission of AG Peg is of thermal origin and almost all of the source counts are at energies below 2.0 keV. 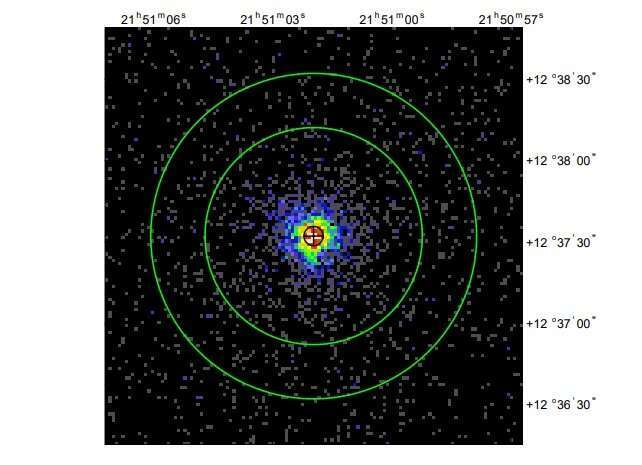 This, according to Zhekov and Tomov, confirms that AG Peg is in its post-outburst state and is of the class beta of the X-ray sources among the symbiotic stars. Furthermore, the observations detected no short-term X-ray variability. This, together with ultraviolet emission showcasing flickering on time-scales of minutes and hours, suggests that the X-ray and UV emissions in AG Peg originate from different regions of this binary and are subject to different formation mechanisms. In concluding remarks, the researchers attempt to explain which mechanism is behind the X-ray emission in AG Peg. They assume this emission could be caused by colliding stellar winds (CSWs) in the binary system. However, the scientists emphasize that solid evidence for a massive enough hot stellar wind is needed from observations in other spectral domains to confirm this hypothesis. "If no such an evidence is found, then the CSW picture will face serious problems and a different mechanism must be proposed for the origin of the X-ray emission from this symbiotic binary," the authors of the paper concluded.